A greatest hits set and ‘one of the greatest records of all-time’ are given the treatment, Andy Kelly is swept away. We’ve enjoyed our Christmas fix of the Bunnymen in Liverpool for a few years now, and this year it arrived rather earlier than usual. The new setting of the Echo Arena allows several thousand extra devotees to make the annual pilgrimage. 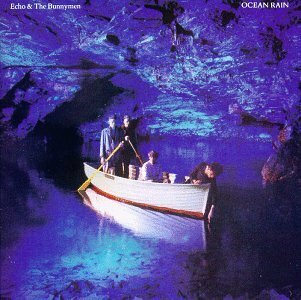 This gig was a celebration of Ocean Rain, the classic 1984 album which many regard as their Bunnymen’s masterpiece, and delivered with the backing of a 20-odd piece London Metropolitan Orchestra. The main event, though, is saved for the show’s second half, with the audience warmed up with a blast through loads of old favourites in the opening segment. 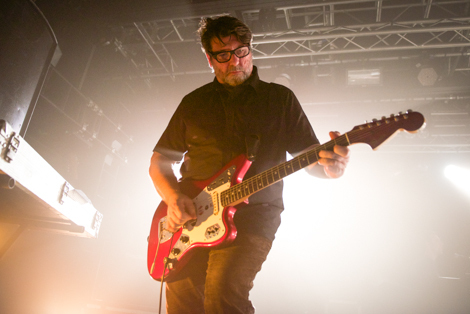 You can always depend on Will Sergeant‘s majestic guitar to deliver the goods at Bunnymen gigs, with Ian McCulloch‘s voice recently the unknown quantity. Mac has been on the lozenges though, cos tonight he’s in stellar form and the band kick off with a superb trio of Lips Like Sugar, Rescue and a rattling Villiers Terrace. Not many bands have written a song as good as any of those three, yet the Bunnymen can open with them. The momentum barely lets up with Back of Love, Bring on the Dancing Horses, and a stunning The Cutter, all delivered with serious aplomb. As ever, Mac spends most of his time in the dry ice shadows creating those famous silhouettes which adorned a thousand bedroom walls. The Doors cover, People are Strange is a welcome addition, while the sweeping Nothing Lasts Forever morphs, as ever, into Walk on the Wild Side. On to Ocean Rain then and Mac’s in magnanimous form, describing it as only ‘one of the best albums ever made‘. It’s accompanied by stunning black and white archive band pictures on the big screens which must be turned into an exhibition. Please! Ocean Rain ‘s windswept and dark romanticism – as befits something recorded between Paris and Kirkby, as Mac proudly tells us – is given superb new power with the lush orchestral strings. Some songs fare better than others – Silver, Crystal Days and Seven Seas being particularly impressive. The Killing Moon, of course, doesn’t need any help, while My Kingdom sees Sergeant hit top gear just in time for the finale of the title track. The crowd still want more but Mac suffices with a bow. You can’t really follow a song as beautiful as Ocean Rain.